Demonetisation has hit citizens across India, but it is the lower stratas of society that are struggling the most with the currency ban. Farmers in Bengal have said that if the situation carries on for 15 days more, the state could be headed for a famine as the state stares at an impending food shortage. Bengal as a state relies heavily on agriculture and 70% of the rural economy has been hit hard by PM Modi's demonetisation move. The paddy planted in the last season is ready for reaping, but the farmers can't do anything about it. They cannot sell their harvest. 50% of the total cultivation - 20 lakh hectares of paddy - are lying in their fields, untouched. With all this produce on the verge of being wasted, farmers fear that a famine-like situation is highly possible due to food shortage. Co-operative banks, where most of the farmers' savings lie, are unable to exchange or accept deposits being made by the farmers in scrapped notes, and also cannot give them loans. Because of this the farmers cannot buy seeds for the next season and another situation of food shortage seems to be on the cards. Tushar Majhi, a farmer from Burdwan, said, "The situation is turning worse each day as we could not collect loans from the co-operative bank. And as there is cash crunch of Rs 100 notes, we could not sell the paddy in the market." Majhi also added, "Due to the cash crunch we could not purchase any raw materials and our daily life has been affected." Mrinal Mahanto, a farmer from Birbhum, said, "We do not know for how long the situation will continue as we are now facing a helpless situation due to the cash crunch. Modiji has said that we have to wait for 50 more days and if this situation continues then a famine might occur in Bengal." And the state agriculture minister Purnendu Bose agrees. Bose has warned of a famine if "the situation continues till the first week of December." On Wednesday, a team from the Union Agriculture Ministry along with the officials of state government visited various districts of Bengal and spoke to the farmers to know about the problems they were facing after demonetisation. They assured that steps will be taken to resolve the crisis. 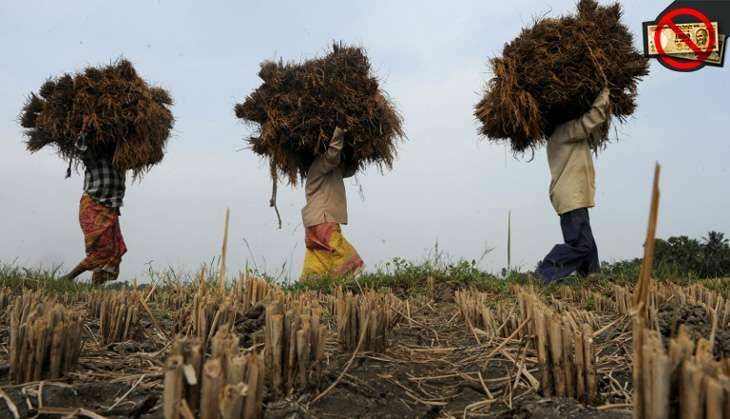 After getting to know of the problems being faced by the farmers, the Bengal government convened an emergency meeting with the Reserve Bank of India (RBI) officials and urged them to circulate notes at the banks in the rural sectors which have been badly hit. The co-operative banks in West Bengal are already on the verge of collapse as the farmers are unable to withdraw or deposit cash or take loans. The co-operative banking sector provide credit and deposit facilities to around 50 lakh farmers in the state and with RBI not allowing co-operative banks to receive fresh cash from the central bank in exchange of its own reserve, the system has virtually collapsed. Pradip Majumder, agricultural advisor of state government, said, "We have received complaints from various farmer organistaion that they could not sell paddy due to demonetisation and we have also convened a meeting with the agriculture minister to plan strategies so that farmers get some relief." BJP state president Dilip Ghosh said, "Chief minister of West Bengal is aggrieved after PM announced demonetisation and it will take time, for normalcy to be restored in India. Union Finance ministry has already eased some norms and we hope that farmers will get the benefit as early as possible." "There is no need to panic," Ghosh assured.